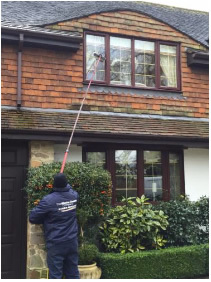 Providing a window cleaning service to our domestic customers, satisfaction and security is of primary importance to us. 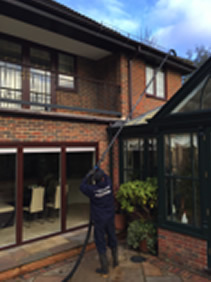 We offer a choice of affordable options for standard cleaning services: Regular external window cleaning on a 4,6 or 8 weekly basis to suit your needs. We also provide end of tenancy cleans, one off cleans and builders cleans. Using the latest water fed pole system and pure de ionised (distilled) hot water we always clean your window frames and sills as part of our standard wash. Because we use a telescopic pole to reach your windows, we can reach the windows that can’t be reached by traditional methods, such as behind conservatories and roof windows.